The Sharp distance sensors are a popular choice for many projects that require accurate distance measurements. This IR sensor is more economical than sonar rangefinders, yet it provides much better performance than other IR alternatives. Interfacing to most microcontrollers is straightforward: the single analog output can be connected to an analog-to-digital converter for taking distance measurements, or the output can be connected to a comparator for threshold detection. 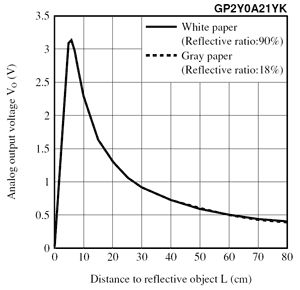 The detection range of this version is approximately 10 cm to 80 cm (4″ to 32″); a plot of distance versus output voltage is shown below. 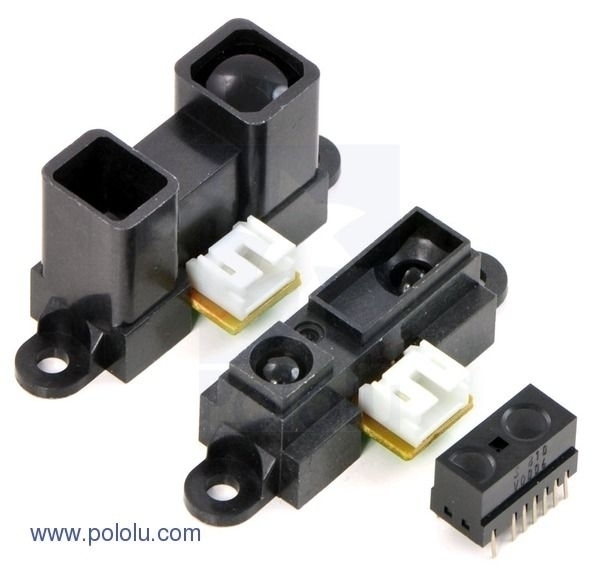 The GP2Y0A21 uses a 3-pin JST connector that works with our 3-pin JST cables for Sharp distance sensors (not included) as shown in the upper picture on the right. It is also simple to solder three wires to the sensor where the connector pins are mounted (see the lower picture to the right). When looking at the back, the three connections from left to right are power, ground, and the output signal. We carry a shorter-range (4 – 30 cm) version and a longer-range (20 – 150 cm) version of this sensor. 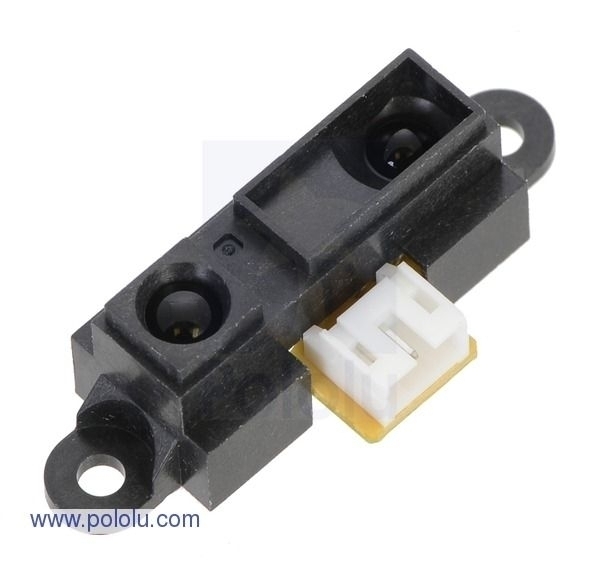 These analog distance sensors have similar packages and identical pin-outs, making it easy to swap one version for another should your application requirements change. We also carry two digital Sharp distance sensors that have lower minimum detection distances, quicker response times, lower current draws, and much smaller packages; they are available with a 5 cm or 10 cm range and simply tell you if something is in their detection range, not how far away it is.